...did not offer guides/information specifically for Office 365/SharePoint Online scenario's. Something as simple as "what to use as the Bing Maps application URL for an Office 365 tenant?" was not to be found. Create a generic script, because as a consultant I'll want to use this script more than once for multiple tenants. 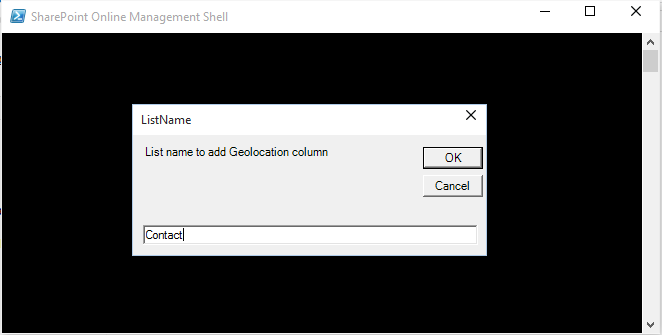 For the walkthrough I'm using the following scenario; As a global admin for the tenant https://yourcompany.sharepoint.com, I'm adding the geolocation column type to the list "Contact" on the sub site https://yourcompany.sharepoint.com/sites/sales and naming the column "Office". Log in with your Live account (@live.com, @outlook.com, etcetera) or create one to gain access.
. Application type: What is the application? App, site,for non-profit use, etc. After you click Create and the Captcha was filled out correctly, the page refreshes and displays your new key below. You'll receive a 64 character key.
. Site URL: URL to the site where the list is.
. Login account: at least admin permission as you're changing list settings.
. List Name: name of the list to add the geolocation column type.
. Column Name: title of the geolocation column.
. Bing Maps Key: to register the app and remove the notification in map view. The actual programming part in the script I modified from the script posted ina blog post by Albert Hoitingh. I wanted to remove the hardcoded values from the code, so the script can be run based on user inputs. So I added the interface (input boxes, confirmation, write-hosts), replaced the hard coded values and added comments. 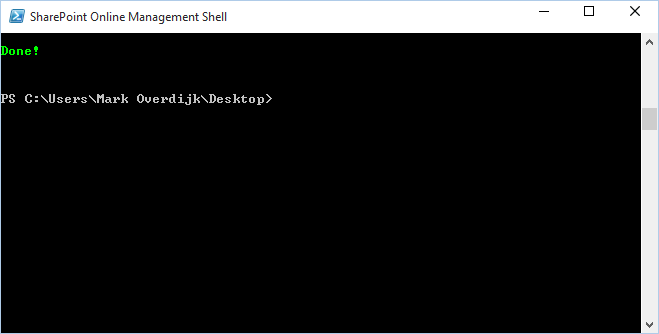 When you run the script, PowerShell will ask the user to input the information we gathered in Step 2. After the last values have been entered, the admin will see a confirmation screen where the values can be review and confirmed (if the input is incorrect, the script can be cancelled by entering "N" to not proceed - screenshot). After confirmation, the admin will be prompted to enter the password. If everything was filled out correctly, the script will run and returns with the "Done!" notification upon completion. Return to your SharePoint online list and you'll notice when creating a new view for your list "Contact", you gained the option Map View. When checking the list settings, the column "Office" has been added of the type Geolocation. Are you missing information, do you want me to clarify anything, do you want to post a conversation starter or do you just want to say thanks? Leave a comment. Newer PostRapid Circle wins Microsoft ‘Worldwide Health Partner of the Year’ award.